*Brand new bras (tags-on only, please). *Unopened boxes of tampons and pads for all ages & sizes. We now have office hours if you want to bring items to us! We are also happy to schedule a pick-up of items. 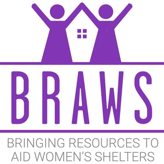 Please contact us at mailto:jennifer@BRAWS.org for more information.